Well, it turns out my translator’s computer crashed, and so I didn’t get the French version of my abstract until exactly 12h today. I printed my thesis—all 87 pages—bound it in ACCO-press binders, applied the necessary stickers, packed everything up and then wondered why I hadn’t heard back from my supervisor. He’s generally very fast at responding to emails, and last night he offered by email to sign my thesis submission form this afternoon, so it was surprising that he hadn’t got back to me. I called his office. I called his home. I sent another email. I decided to do a stakeout at the Biomedical Ethics Unit and see if I run into him. When I was putting on my shoes, I considered for a moment whether I should put on my running shoes or my regular shoes. I had this nagging feeling like somehow I would end up sprinting to the James Administration Building at the last second, and that I would be happy to be wearing running shoes. Then I dismissed that thought. All I had to do, after all, is get my supervisor’s signature and then walk across the street and submit it. Putting running shoes on would be silly. I put my regular shoes on and went to the Bioethics Unit to look for my supervisor. I ran into the administrative assistant who informed me that he was having a terrible day. A few seconds later I got a phone call from him. Apparently my supervisor had a minor car accident and spent the morning in the emergency room. He invited me to his house to have the forms signed. This would not normally have been a problem, but Villa-Maria station (where he lives) is closed until September 6, and so I went to Vendôme station and hired a cab to get me to his place. I saw the back of his car when I arrived. There were indentations that I’m sure were never intended by the manufacturer to be there. My supervisor and his family are all right, I think, but understandably this has been a bad day for them. The forms all signed, I sprinted to the nearest Bixi station and decided that it would be fastest to just ride the Bixi all the way to campus. This may or may not have been the case, but I made it back to campus in 25 minutes, which is probably better than what it would have taken to get to a métro, wait, transfer at Lionel-Groulx and then walk from station McGill to the James Administration Building. I guess I’m paranoid because I’ve recently had two separate experiences where I handed in everything on a document checklist only to receive a mystifying message later on, indicating that I failed to submit all the required documents. I don’t plan to use this recording for anything but soothing my own nerves, for the record. It just feels good to hear someone say that I submitted everything. So after all that, I have now made initial submission of my thesis. Hooray! This last essay was particularly painful to write. It’s not that I found the material less interesting, or that there was anything about the essay itself that was bad—I’ve just had a huge headache for the past few days, and all I wanted to do today was sleep. I don’t think the quality of my writing suffered as a result, but it was just harder to get through it. I’ve been drinking water and taking acetaminophen, but I think it’s just the stress catching up with me. I’m tired and I’ve had a hard time sleeping lately. I was originally planning on writing about hyperintensionality, but I couldn’t find the right sort of sources for the essay I wanted to write, so I decided to write about Kit Fine, the guy that I did my in-class presentation about. He argued for modal pluralism, and I was reasonably convinced by him, and I was going to defend him from Chalmers and his zombie arguments. While writing this essay, though, my opinions changed. I started as a modal pluralist, and ended up a modal monist. Good work, David J. Chalmers. And, like other philosophers, he would be totally socially unaware of himself, and not notice his friends rolling his eyes at him. If you will direct your attention to the graph, you can see that there were a couple plateaus in my productivity, right around lunch-time and dinner-time, which is to be expected, but I generally worked well up until the end. Speaking of the end, the end of this paper officially marks the end of the course-work for my MA. If I don’t want to, I don’t ever have to attend a class again. Tomorrow I start work, and I’ll let you know how that goes. I called in this afternoon to confirm that I’m coming in and to find out what time I start. I start at 9h. I’ve never had a real 9-5 before. I’m going to hit the sack early and hope to feel all better by tomorrow. If not, I still have most of a big bottle of easy-to-swallow analgesics, so I should be all right. Oh, does anyone have a suggestion for a work of fiction for me to read? I finished the Deptford Trilogy recently, and I’m looking for something to fill my “things that I read on the Métro” void. Posted on 2010 April 28 2010 April 28 Tags McGill, Philosophy, Schoolwork1 Comment on Done! I’m almost done writing my last essay. It’s on zombies. I’m not even kidding. Zombies are surprisingly important in philosophy of mind and metaethics, and a lot of ink has been spilled by philosophers over a thought experiment involving them. This is the last assignment for my coursework for my MA. After this, the only thing that’s left is my thesis. Depending on what I decide to do after I graduate, I may never sit in a classroom again. 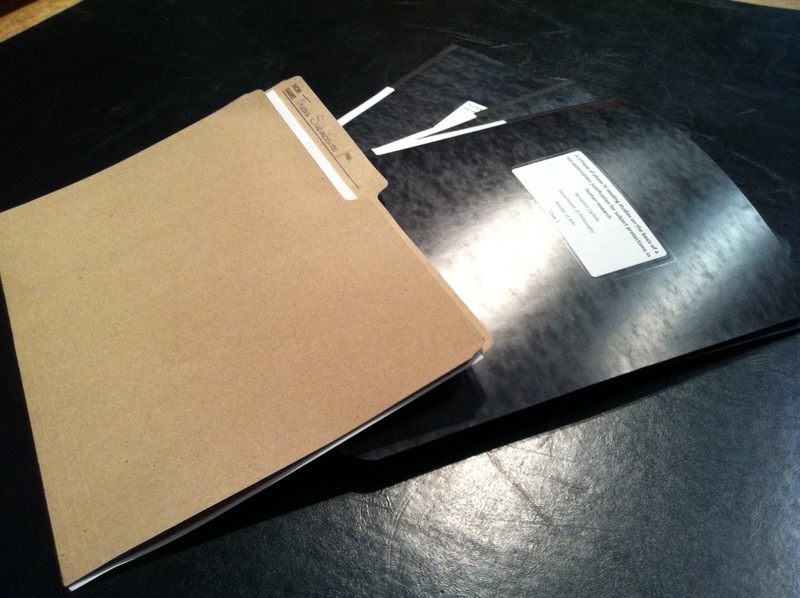 Part-way through this semester, my professor handed me a large stack of official-looking papers relating to an ethics consultation with a CLSC here in Montréal. He indicated that the papers should be shredded when I was done with them, since their contents were sensitive. It felt good to put them through the shredder. I think it might be the finality of the act. 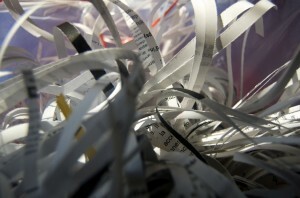 There is a satisfying noise that the machine makes as it takes all the meaning out of the paper that you feed into it. It’s magical really: Pages and pages of meaningful information go in one side, and then strips meaningless paper come out the other end. By the way, I only have one paper left, and I have a pretty good idea of what I’m writing too. On last Wednesday, I had my Bioethics Practicum presentation. I was stressing about this particular assignment for a while, but largely thanks to the hard work of my partner, it turned out very well. In fact, after the our time in front of the class, the prof indicated that he had been to presentations done by professional bioethicists, who were hired for sums of thirty to forty thousand dollars, who did not produce so thorough an examination of the issue at hand as my classmates and I did in our assignments. I felt flattered of course, and asked him if we could have thirty or forty thousand dollars. I’m really quite proud of myself for the way that I’ve been working all semester at my Practicum journal. I don’t think I’ve ever been so consistent at working away at a small task on a weekly basis. I remember every once in a while, through grade school, there would be an assignment for a class where I have to make journal entries or something like that, every week over the course of the year, and invariably, I would fail to even think about the journal assignment until the last week of the class, when I would put together a bunch of entries, look up dates for when the entries should have been made, and do a generally bad job of it. This time, and probably for the first time ever for this type of assignment, I actually did do the work incrementally. The assignment was to write 3 things that we learned from each class in a journal to be handed in on the last class. I’m just figuring out what to write for my last journal entry now, then I’ll print it, and that’s all I have to do. No furious scrambling through my old notes. No forging of dates with my calendar. Just type-type-type, command-P, enter. If only I had developed this skill of working steadily throughout the year in grade 7. It would have made my French cahier a much less stressful piece of work. As of 17h15 today, December 26th, 2009, I have officially finished all my work for this semester. My last essay is due tomorrow, and I just finished it now and emailed it to my professors. When the classes ended for the semester, I had no idea what I was going to write about. I was pretty much done by the 24th, and I didn’t work on it at all yesterday. Then today, after going out for a bit with my mother and younger sister, I came back home and put the finishing touches on my essay. It’s an essay regarding a particular philosopher/cognitive scientist and his take on, among other things, a man named Ian Waterman with a very interesting neuropathy which left him without a sense of touch or proprioception below the neck. I’m happier with how it turned out than I thought I would be. I’m going to spend the next few days relaxing and collecting my own thoughts about the last few months and getting ready for another action-packed semester. Actually, I really hope it isn’t as action-packed as the last one. I need a break. Only one essay left now! I just finished another essay. This is the paper for my Bioethics Theory course. 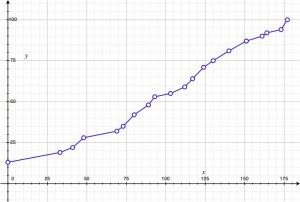 Check out the graph of my progress! Along the x-axis is minutes after 10h this morning. 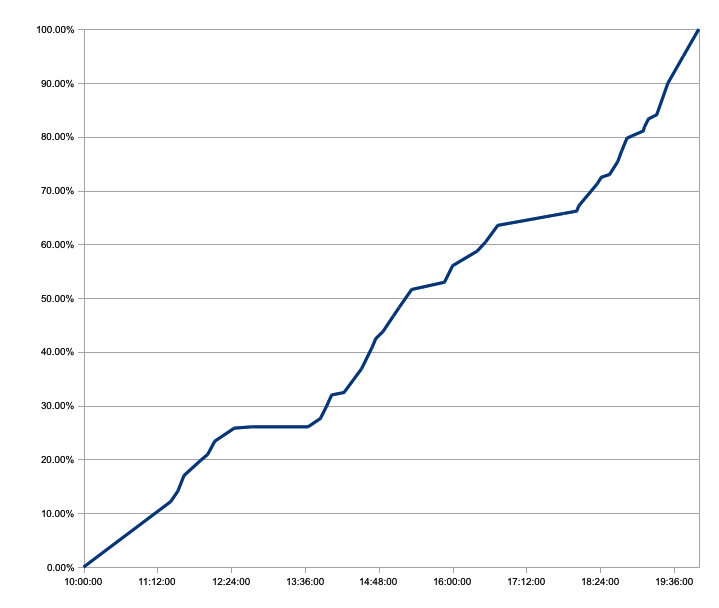 Along the y-axis is word count. My essay is done, but I could probably go through it and put a bit more work into it tomorrow. My brain is fried now, though. You can see there were some distractions. Part-way through the day, I got caught chatting when I should have been working. You know who you are! After this, I have two sets of papers to mark, and only one essay left, but that one’s going to be painful because it’s for the Merleau-Ponty class. Posted on 2009 December 10 2010 August 8 Tags Bioethics, Schoolwork1 Comment on Only one essay left now! So late last night, I finished the first essay of my late-term essay season. 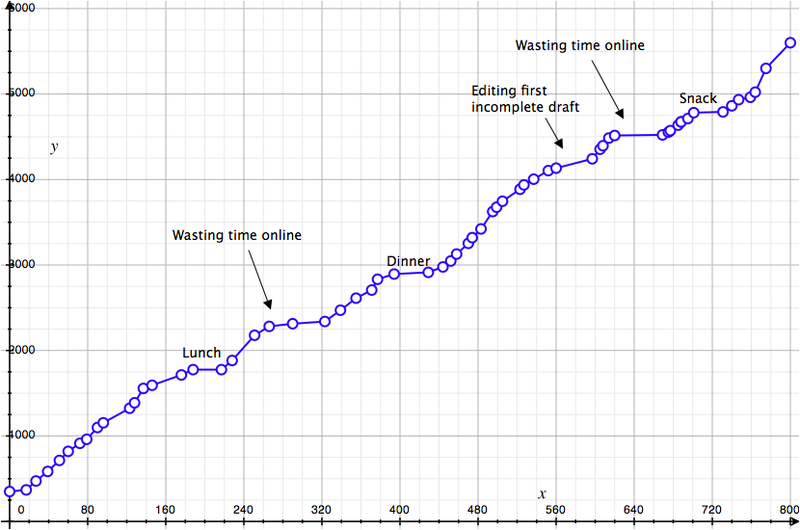 One thing I do while I write, to keep me motivated, is graph my progress. 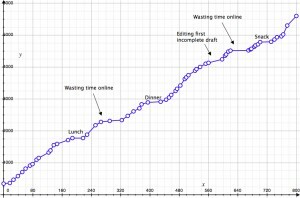 Whenever I’m taking a pause to think about how I’m going to word something or what I want to write next, I click on the Word Count button, then divide that number by the number of words I want my essay to be, multiply by one hundred, and plot that according to the number of minutes of work it took me to get to that word count. 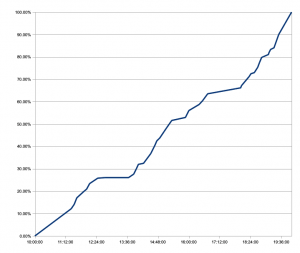 So along the y-axis is the percent of the word count and along the x-axis is number of minutes. 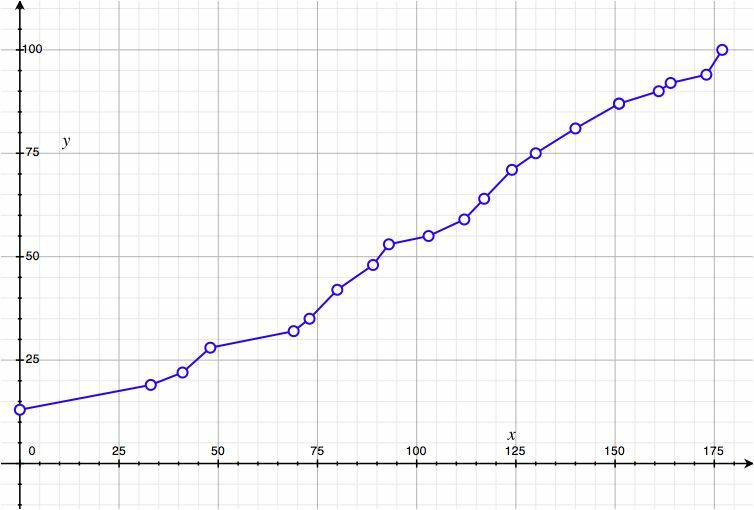 I started doing this last year, and I now have a lot of graphs of the rate of my schoolwork. After I finish, I like to look at it and see where I was most efficient, and try to figure out what it is that helped me out so much. In this case, I took a nap around the 1-hour mark, and then there was a short period of low productivity, but after the nap, I worked harder than ever before.